Two Deluxe Master Suites Plus A Terrific Entertainment Room! Sleeps up to 8! Welcome to Moose Hollow MH1310! This deluxe two bedroom is elegantly decorated and features a spacious kitchen and open living room so you have the space you need to enjoy time with friends and family. WIth two master suites, two living rooms with TVs, easy access to the community hot tub, and endless nearby outdoor recreation, you will love every minute of your stay at Moose Hollow 1310! Main Level: Kitchen, living room with TV, half bathroom, full bathroom, balcony, and bedroom with ensuite full bathroom. Upstairs: Bedroom with ensuite bathroom, laundry room, and entertainment room with TV. Bedroom 1: 1 King suite bedroom with TV and full ensuite bathroom. Sofa Sleeper in Family Room. Bedroom 2: 2 Queen bed suite with ensuite bathroom. 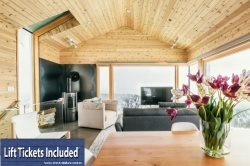 We are truly excited and honored to share our homes with each and every guest and we invite you to stay with us at Powder Mountain Getaways - MH1310!